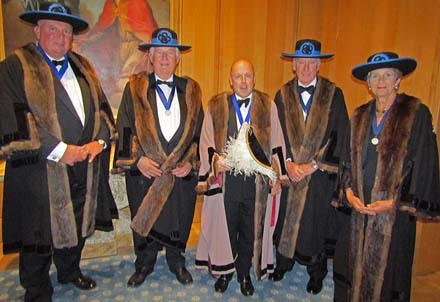 Friday 6th October turned out to be a chilly but dry evening in the City, as Liverymen of the Feltmakers’ Company welcomed their newly elected Master. Our evening commenced in the company of Feltmakers and their guests, all within the magnificent structure of the Haberdashers’ Hall, an opportunity to meet old friends, making new ones, as well as to acknowledge and mingle with our newly appointed Liverymen. Climbing the impressive winding stairwell in Haberdashers’, we were greeted at the top with a warm welcome, smile and handshake by our newly installed Master, His Honour Judge Nicholas Hilliard QC, Recorder of London, along with the four Wardens of the Company. We then proceeded into the Gallery for a champagne reception, a golden opportunity to congratulate individually our new Master on his Installation. 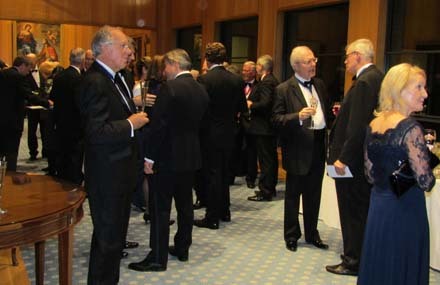 Mrs. Sarah McLeod (Assistant) welcomed Lord Carlile of Berriew, CBE, QC, FRSA; Alderman John Garbutt JP, Upper Bailiff Weavers; Mr. Christopher Thierry, Master Woolman, and Mr. Nick Steidl, Master Stationer and our three new Feltmakers, as well as guests, to the Installation Livery Dinner. The Master proposed the Loyal Toast to Her Majesty the Queen followed by that to the other members of the Royal Family. Lord Carlile of Berriew rose and toasted the health and prosperity of the Master. 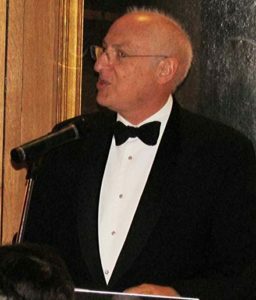 His Lordship was elevated to the life peerage in 1999 and is a non-affiliated member of The House of Lords, being described as one of Britain’s top legal experts. He made reference that he is indeed pleased and fortunate to know our Master and has known him through a long and distinguished legal career, as well as knowing the former Speaker of the House of Commons, The Rt. Hon.Betty Boothroyd OM,PC, now a Baroness in the Upper Chamber, who is an honorary Feltmaker. He also made a lighthearted reference within his speech to his being elevated to the peerage only by virtue of the fact that at the time he was the only Welsh Liberal Democrat so there was no one else, proving that even eminent QCs have a sense of humour. Our new Master responded by thanking His Lordship for the kind remarks and congratulated Past Master Jeremy Brassington on having had a very successful year. He also paid tribute to Cmd Ian Wellesley-Harding RN whose initiative it had been for HMS Lancaster Type 23 (Duke Class) Frigate to become associated with our Livery. 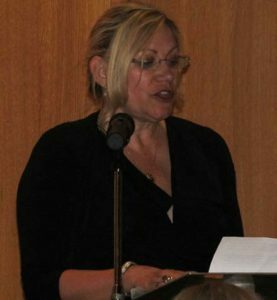 The Master also thanked all concerned for the valiant effort in making the evening a success. 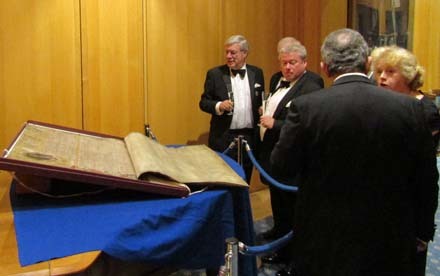 A special mention was made of the Clerk, Major Jollyon Coombs, and the Feltmakers’ Historical Committee’s efforts in obtaining and showing the Charter, reminding all that it would be still on view at the end of dinner. Here comes the Judge, here comes the Judge, silence in the court room for here comes the Judge. The Judge has arrived, a great evening was the consensus of ALL. For the latest articles and news. 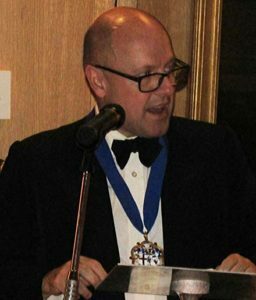 Feltmakers Livery Society Dinner, Feb 05 2019. And we welcome to the Livery in 2017 …. We welcome to the Livery in 2016 ………. We welcome to the Livery in 2015 ……………..